Coach Bob Boldon knew that his team’s effort in rebounding against Central Michigan was present. And really, the effort was there in the other aspects of Ohio’s game, too. But the results were not. Central Michigan, the best rebounding team in the MAC, is simply just good. The Chippewas offense is fluid as it regularly looks for the best shot. The Bobcats, though they have the top turnover margin in the MAC, struggled to defend the Chippewas on Wednesday and lost 82-58 in McGuirk Arena. 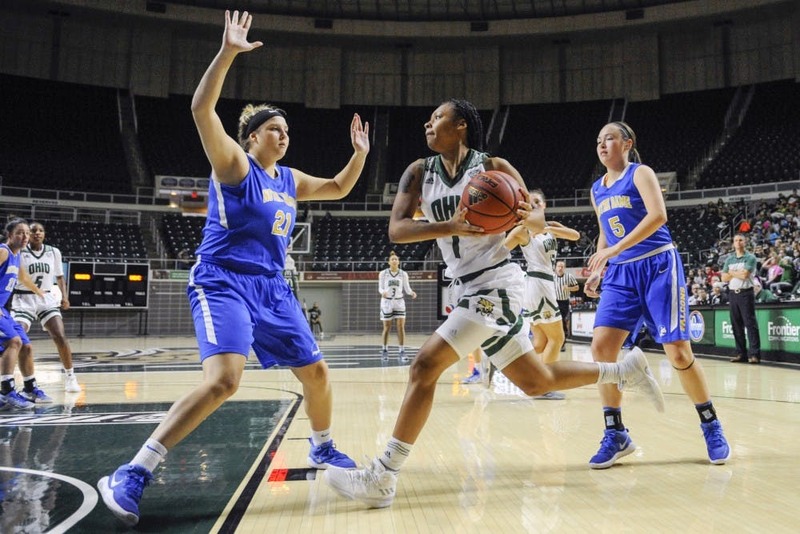 As the Bobcats headed up to Mount Pleasant, Michigan, they were tasked with trying to defend Tinara Moore and Reyna Frost. Both are in the top five in the MAC for rebounds per game, with Frost leading the conference (13.5). The Bobcats lost the rebounding battle 47-28. The Bobcats are last in the MAC for rebounds per game (31.8). They don’t have a lot of size, so playing good perimeter defense has been important for them. The effort was there on defense, but Moore and Frost were a difficult combo to defend down low. That only opened space for the Chippewas to make threes. The Bobcats hadn’t played such an elite offense all season. Still, with it being only the second game of MAC play for them, the game was a good test. After being down 23-16 at the end of the first quarter, a quarter in which the Bobcats held the Chippewas to 1-of-6 shooting from three, the Bobcats couldn’t stay within reach in the second quarter. The Chippewas went 5-of-5 from three in the second quarter, and the Bobcats struggled to defend the perimeter, something they’ve done well throughout the season. Along with that, the Bobcats struggled to defend in transition, and the Chippewas outscored the Bobcats 31-15 in the second quarter. Despite freshman Cierra Hooks finding holes in the Chippewas defense in the first half, the Bobcats couldn’t muster much offense throughout. Hooks led the team with 16 points. The Bobcats (7-6, 1-1 MAC) are two games into conference play, so what’s going to be important is how they fix their mistakes quickly. Ohio plays Akron (6-6, 0-2 MAC) at home Saturday. Boldon thrives off fixing his team’s mistakes. He regularly talks about specific areas the Bobcats need to fix after games, whether they win in dominant fashion or lose in a blowout. And this game against Central Michigan is just another step toward the Bobcats’ growth.